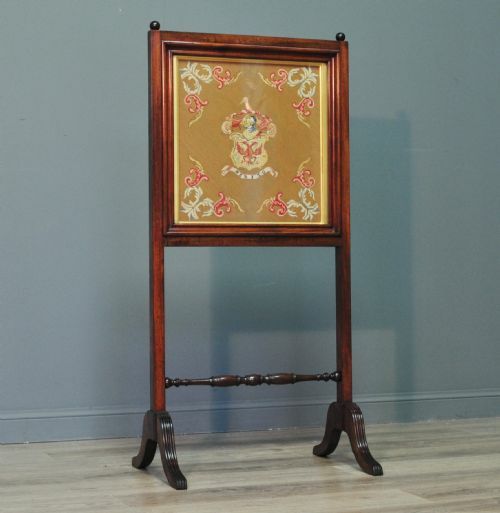 Attractive antique Victorian mahogany 'Dunlop' Tapestry fire screen. A lovely antique Victorian mahogany fire screen. We date this screen to the late 19th century. The screen consists of a central tapestry showing the Dunlop coat of arms and motto. The front of the screen is lined in glass. The screen is raised on four splayed legs and has a turned stretcher for support. There is a further ball finial to each top corner. The screen is 45" (114cm) high by 21.5" (55cm) wide by 16.5" (42cm) deep. This lovely antique screen remains in very good solid condition with only very minor surface markings commensurate with age and usage. This includes some minor indentations around the base. There is an old repair to one of the legs as can be seen in the pictures. This remains a stylish and elegant antique screen which will continue to provide good service for many years to come.